Fenton spent $20 million to open Fenton Nissan of Rockwall. Now, the store is sold. Fenton Motor Group, a dealership company that just a few years ago had more than 20 stores in five states, now faces at least 11 lawsuits as it fades from existence. 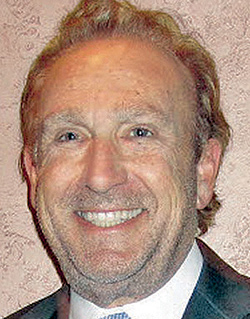 Owner Brad Fenton, a prominent, longtime Nissan dealer who as recently as 2014 was head of the Japanese brand's dealer advisory board, says he is selling off his stores — which included one of the largest Nissan dealerships in the country — as he retires. But that hasn't been easy. His company and dealerships are facing a string of lawsuits across several Southern states filed by lenders such as Nissan Motor Acceptance Corp., Capital One, a credit union and an Oklahoma bank over allegations that range from selling millions of dollars' worth of vehicles but not repaying floorplan loans to breaking contracts and not placing lenders as lien holders on titles. In Texas, Fenton Motor Group also must address dozens of consumer complaints over title missteps. Fenton told Automotive News at the end of March that he still owned five or six dealerships, though all are under contract to be sold. He declined to identify which stores he still owns but said they included dealerships in Oklahoma and Texas. Nissan Group confirmed Fenton — who hosted then-Nissan North America Chairman Jose Munoz for a store grand opening in 2016 and once had nine outlets selling the brand — had just one Nissan store at the end of last month. While Fenton described his exit from auto retailing as a retirement, court documents reveal that he proposed selling several Nissan dealerships as part of a plan to resolve a loan default. Nissan's credit arm, Nissan Motor Acceptance Corp., confirmed to Automotive News in late March that it has four lawsuits pending against Fenton-owned dealerships in Texas, Oklahoma, Kansas and Missouri. A Nissan Group spokeswoman declined to comment on the pending litigation. Fenton: Good stores got sloppy. Fenton's troubles with Nissan Motor Acceptance appear to have begun in February 2018, when the lender conducted floorplan audits and found the group was not maintaining enough working capital and had failed to pay off sold vehicles in the time required, according to a December lawsuit filed in Carter County, Okla., against Fenton Nissan of Ardmore. As of February 2018, Fenton owed the credit arm $11.9 million for vehicles the nine dealerships had sold but had not repaid floorplan loans on, known as being out of trust, according to court records. The parties entered into several agreements last year in an attempt for Fenton to pay off debts. In one early arrangement, Fenton agreed to sell several Nissan dealerships, while Nissan Extended Services North America advanced the Fenton group $9.5 million to pay out-of-trust-amounts and recapitalize dealerships. By November, new audits found Fenton Nissan of Ardmore had sold 130 vehicles out of trust and owed Nissan's credit arm $2.75 million, the lender alleged in court records. Nissan Motor Acceptance filed suit, seeking to repossess vehicles used as collateral. The court granted a restraining order that allowed Fenton Nissan of Ardmore to continue selling vehicles under certain restrictions. In February, however, the court ordered that Nissan Motor Acceptance could take possession of nearly $2.5 million in vehicle inventory after the credit arm said it discovered four vehicles had been sold and loans on them weren't repaid. In December, Nissan Motor Acceptance Corp. also filed lawsuits in Jackson County, Mo., against Fenton Nissan of Lee's Summit and Fenton Nissan of Tiffany Springs; in Rockwall County, Texas, against Fenton Nissan of Rockwall; and in Wyandotte County, Kan., against Fenton Nissan of Legends. Capital One, of McLean, Va., has filed five lawsuits this year against Fenton's dealerships in federal courts in Oklahoma, Missouri and Texas, seeking nearly $5 million over alleged breach of contracts. A Capital One lawsuit filed last month against Fenton Nissan East in Oklahoma seeks more than $1.8 million in damages, plus attorneys' fees and costs. The lawsuit alleges problems with at least 99 vehicle contracts between Oct. 2, 2017, through June 11, 2018, such as misrepresenting down payments by customers; misrepresenting income of borrowers; misrepresenting that vehicles were traded in when they hadn't been; and improperly charging borrowers for license and registration fees. A March 1 lawsuit filed in federal court in the Northern District of Texas against Fenton Hyundai of Mesquite, Fenton Nissan of Rockwall and Fenton Motors of Pampa, a Ford store, seeks more than $674,000 over breaches of contract. Capital One's allegations, involving at least 46 vehicle contracts dating to August 2016, include not obtaining titles on vehicles to reflect Capital One as lien holder; providing letters overstating borrower income; providing utility bills that indicated borrowers or co-borrowers lived at certain addresses when they did not; and claiming vehicles were equipped with upgraded features when they weren't. A Capital One spokeswoman declined to comment on the lawsuits as litigation is ongoing. Fenton in late March said he hadn't seen the Capital One lawsuit in Texas. "I'm sure we'll work out something with those folks at Capital One," Fenton told Automotive News. "They're nice people, and some of the stores, most of them that are involved in that, are already sold and gone." Fenton Motor in an April 8 response to the lawsuit denied the allegations. Answers have not been filed by Fenton in the four other Capital One lawsuits. Fenton said he decided more than a year ago, as he neared age 65, to retire after starting in the business at 22. Fenton's son had been involved in the dealerships but opted a few years ago to move into cattle and real estate businesses. "I didn't have any more family in the business, so it was time to sell it and move on," Fenton said. At that point, Fenton said, he had 17 or 18 stores. He started selling them in 2018 but said sales have gotten more difficult the last few months. He blamed some of his legal and regulatory woes on the slow sales process of four or five unspecified dealerships in Texas and Oklahoma that members of his management team were supposed to buy. He said those managers "got a little sloppy." "They weren't able to get their financing worked out, so that didn't come together," Fenton said. "And they made some pretty lousy decisions in the 60 to 90 days they kind of were in there operating for me." Fenton said good stores turned sloppy at the end of 2018, and he has been resolving title and registration issues with customers since. "We'll get those cleaned up. I've been working with the lenders and everybody, working together to get this done," Fenton said. "It just got way, way out of hand before I became aware of what the problem was." Fenton's dealerships face a number of consumer complaints over late title transfers and misuse of temporary tags, a spokesman for the Texas Department of Motor Vehicles wrote in an email to Automotive News. A CBS-affiliated TV station in Dallas reported last month that some customers have had issues with temporary tags dating to July. A customer of Fenton Hyundai of Mesquite told the station that she bought her car in October and was still waiting on the title and a permanent license plate. Instead, she said, the dealership sent her three temporary tags. Another customer, who bought a Chrysler Pacifica in July, said she had been issued four temporary tags. The Texas DMV as of late March had 11 open cases with Fenton Nissan of Rockwall and 59 with Fenton Hyundai of Mesquite, DMV spokesman Adam Shaivitz said. 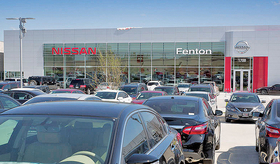 Fenton's only remaining Nissan dealership as of late last month was the store in Ardmore, Okla. Nissan Group confirmed that Fenton within the last year sold three stores in metro Kansas City, in Kansas and Missouri, plus stores in McAlester, Okla., and Rockwall, Texas. Two Nissan stores in Oklahoma City, Okla., sold last June. A receptionist at the Nissan store in Ardmore said the dealership is in the process of being sold, while a receptionist at Fenton's Ford dealership in Pampa said that store, too, was under new ownership. Fenton said a partner of his is in the process of buying the Ford store. In February, PSD Automotive Group of New Jersey purchased Fenton Nissan of Rockwall and renamed it Nissan of Rockwall, said Steve Kaplaneris, the store's executive manager. That dealership is among the largest Nissan stores in the country. Fenton spent $20 million to open the store, which boasts 157,000 square feet and 47 service bays. Then-Nissan North America Chairman Munoz attended the grand opening celebration in July 2016. Fenton at the time had 19 dealerships in Oklahoma, Missouri, Kansas, Tennessee and Texas. Kaplaneris said Nissan of Rockwall has nothing to do with the Capital One lawsuit, adding the store is in "perfectly good standing with Cap One." He said when PSD Automotive took over, it worked tirelessly with customers who needed outstanding titles finalized. The CBS station in Dallas said KamKad Automotive Group in Dallas was negotiating to buy Fenton Hyundai in Texas. Representatives from KamKad did not respond to requests for comment. "All the stores are either sold or under contract now," Fenton said. "My mission was to be retired by the end of '18, and I didn't quite make it. But it's getting pretty close here."